Machine Builder Components | Automatic Fastener Feeding & Driving Equipment from Visumatic. Visumatic is a leading supplier to specialty machine builders, providing modular building blocks for customers who are implementing an automatic assembly process. Our expertise in fastener automation allows machine builders to quickly integrate component systems for immediate functionality. Systems are designed to interface with your equipment with your bolt hole pattern, counterbores, flats or bosses. They include integral I/O contacts, cabling and a suggested PLC code, all carefully planned and written for you. Our designs fit seamlessly. Our #1 selling feeding and driving system to install screws, nuts, rivets and push pins over a wide torque range, in one or multiple locations. Handles very small to extra large fasteners. For incorporation into six-axis robots or X-Y-Z cartesian positioning systems to automatically feed and bit–stroke screws into parts. "X-Thread Eliminator" for the best insurance against cross threading. Modular 4-axis robot system for rapid deployment in automated assembly projects that require driving fasteners quickly & accurately. a complete feed and drive system takes your cobot to the next level. A “Plug-n-Work” Robotic X-Y positioning systems for multiple-screw placement with independent drivers. Simultaneous multiple screw placements to significantly increase productivity. 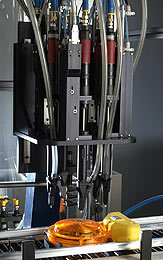 Simultaneously drives multiple screws for use in high volume automated assembly machines.. Operator pre-load assembly stations with automatic part transfer to fully automated, multi spindle screw driving stations for simultaneous driving, finished assembly conveyance.